IT started as a dare – it ended as a life-changing career opportunity. Lee James kept telling his best mate it was possible to climb into a balloon. Being a likely lad from Oz’ when his mate ended up calling his bluff Lee – now known on the world entertainment circuit as Bruce Airhead – stepped into a balloon and a new career. 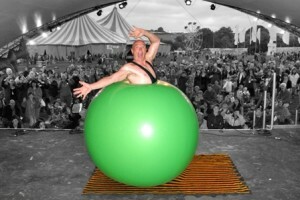 His amazing performance with a six foot balloon, and some baby oil, can be seen at the Shrewsbury International Street Theatre Festival from Friday, September 2, to Sunday, September 4. He worked at anything when he first arrived and had always been able to do some magic and balloon modelling as a street entertainer. But after “mouthing off” once too often about climbing into a balloon, he was forced to give it a go. “It was my one and only eureka moment. I did it for a laugh but when I saw the video of what I had done, I thought there is definitely something here. The balloon is just like any balloon, basically a very large latex balloon, which costs about £20 a time. It’s very difficult and extremely hard work, physically very tough,” said Lee, who went full-time as a performer seven years ago. 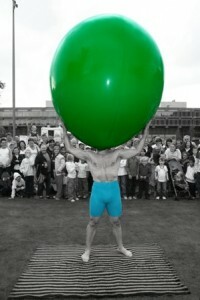 He inflates the balloon with a voice activated vacuum cleaner, strips off to lycra shorts and applies some oil so that he can pop his head inside the balloon. The trick of course, is to prevent the balloon from bursting. The spectacular finale has a canon shot of confetti pooping out of the balloon and the balloon bursting with Lee – or “Bruce” – emerging dressed as Elvis, although the act is adapted so that he can emerge as a monster, gangster, David Beckham, a sheik, cowboy, Superman….well you get the picture. He has appeared on TV many times on shows such as Graham Norton, and TV talent shows. Ruby Wax said after watching his performance: “I wonder what happened during your birth?” He’s just returned from performing in Egypt, where the heat made his act extremely demanding. And he has a gig planned for Holland, where he will be performing seven shows a day for five days. “I’m going to keep going with it as long as I can, who knows what the future will bring, right now I’m just riding the wave. If it had not been for my mate and that dare, who knows what I would be doing,” said Lee.